I have these two items. The USB cable and the bluetooth bit, which has a phono jack on one end, and just a micro usb socket on the other end. When you open the arm rest up in the centre console, do you have the OEM Porsche Y cable connected by chance for the iPod? Negative on that. No cable, just the 3 sockets, aux usb and ipod. Nothing happens when you hit iPod? Yes nothing happens if I hit Ipod; just a message saying no Ipod connected. The BT device has a 70% charge. Where yours says iPod, mine says AUX. I think you may be right. But thanks for taking the time to help. Sorry I didn't reply earlier, been away on holiday - FZP's instructions for getting it to work are spot on! On my car you press the DISC button repeatedly to toggle between DISC and AUX, I took a picture after pressing it twice. Another tip is to set your aux volume right up to the max, as the default setting will be much quieter than other audio sources (even if you get your phone volume up). You are doing nothing wrong and the other guys are all correct but - What has happened is somebody has "hidden" the aux input for your car. I had the same issue and the manual is useless. The problem is that because all of the sources are hidden - you cant get to the menu to unhide them. 2. load the CD into the PCM and let it start playing music. 4. you should see now in the option. area at the bottom right a button to "SET DISC/AUX"
This is the OPTION menu when you are playing a disc. Hope this helps others too! Great post MK. It's great when people can solve what should be simple issues in the forum like this. Result! Thanks guys and MK that was a great set of instructions. All sorted now. This forum is outstanding for sorting issues! I am a bit baffled as to why Porsche felt the need to encrypt the functionality of their sound system though. Great stuff. Best £10 I've ever spent. 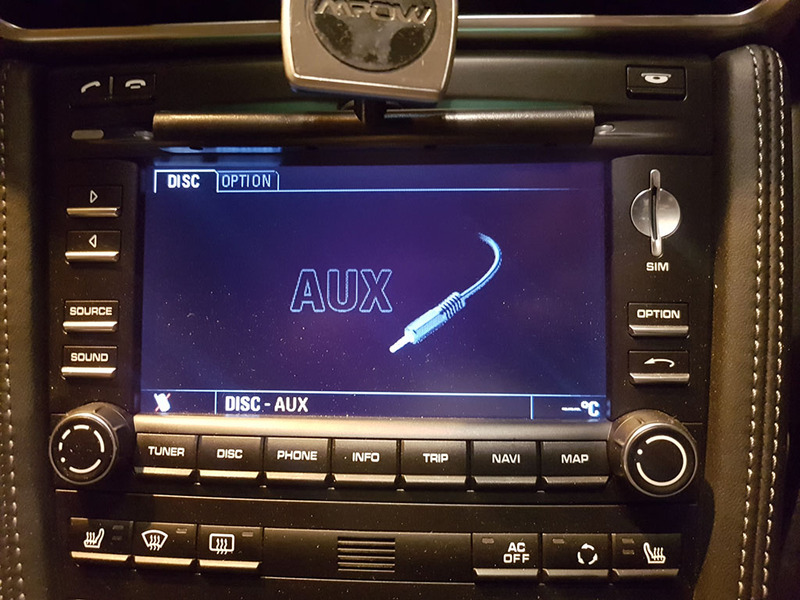 Audi have a proprietary cable for the AUX, which costs double of the BT adapter.